LOS ANGELES, CA, UNITED STATES, August 26, 2018 /EINPresswire.com/ — It began November 9, 2016, in a message, simple yet with an undercurrent of utter dismay: “What the f–k do we do now?” Sara asked, her grief and rage overcoming her manners. “Why are you asking me? I hardly know you.” K-B wasn’t ready for correspondence, having spent the previous day working a polling place giddy with Trump supporters. So was born Writers Resist. The online literary journal launched at WritersResist.com on December 1, 2016. Visit WritersResist.com for more information. Kit-Bacon Gressitt, a former newspaper columnist and a Women’s and Gender Studies lecturer, is an award- winning writer, editor and teacher. Her work can be found in Not My President: The Anthology of Dissent, Ducts, Trivia: Feminist Voices, The Missing Slate, Evening Street Review, Publisher’s Weekly, San Diego Poetry Annual, and Chiron Review. Sara Marchant’s work has been published by Full Grown People, Brilliant FlashFiction, The Coachella Review, East Jasmine Review, ROAR, and Desert Magazine. Her writing has been anthologized in All the Women in My Family Sing and the Running Wild Novella Anthology; and her novella, The Driveway Has Two Sides, was published by Fairlight Books in July 2018; and her memoir, Proof of Blood, will be published by Otis Books in its 2018-19 season. For interviews: Contact [email protected] or 760-522-1064. Writers Resist: Anthology 2018 contributing writers and artists are based around the globe, from the United State to Nigeria, Turkey to Britain to Brazil. Many are well-published and well- known in literary, performance and other fields, many are new to writing—and new to activism, spurred on by a passion to challenge the current U.S. administration through literature and art. All are devoted to the resistance. “DON’T BUY THIS BOOK! The Whacked Out Writers Resist book is BAD. Its FAKE fiction! Poetry doesn’t rhyme! Essays are TOO LONG! Writers are NOT smart! Should be in jail. 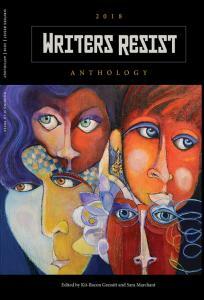 It goes down as WORST ANTHOLOGY EVER by far! Don't read!